The Capitoline Museums, which is considered one of the oldest public museums in the world, contains works from the Roman era, but also some pieces from Medieval Ages, the Renaissance and the baroc era. The Museum of the Palazzo dei Conservatori contains a collection of antique art which includes the She-Wolf (Lupa Capitolina). Museo Etrusco: among other pieces, a remarkable gold fibula and the Mars found at Todi. The four Raphael Rooms (Stanze di Rafaello): a renaissance masterpiece decorated by Raphael and his pupils from 1508 to 1517. Pinacoteca: the picture gallery also continas some impressive works by Raphael, Leonardo da Vinci and Caravaggio. Rome.YourGuidetoItaly.com and YourGuidetoItaly.com 2005-2007 © All Rights Reserved. Photos: (campidoglio) David Garry, (sistine chapel) adrian beesley, (Museo Etrusco) Catherine de Luca. 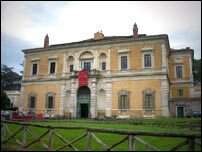 The superb 17th century villa hosts a collection of paintings from antiquity to the 19th century. Julius III's elegant villa features an impressive collection of artifacts from the Etruscans, the people who inhabited Italy before the Romans.